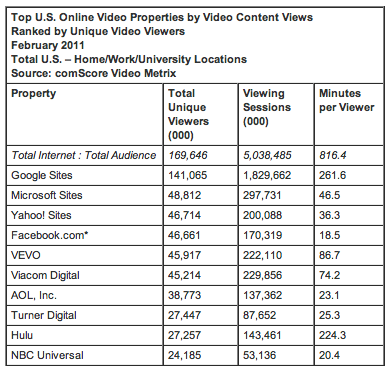 ComScore recently released their February 2011 US Online Video Rankings numbers, which are always an interesting measure of the state of online video. More than 70% of Facebook's 500+ million user population is outside the US. That means we can estimate Facebook's US user population to be around 150 million, which is just under half of the US total population of 307 million people. And by comScore's estimates, Facebook had 46.7 million unique viewers of online video in February 2011, which means that just under a third of US Facebook users are watching video on the site. Given that we've found engagement rates from social media referral sources like Facebook are really high, we think this is an important emerging trend in online video. Also worth noting in this report: 82.5 percent of the U.S. Internet audience viewed online video in February. That's some crazy penetration! For more ideas about using social media and video together, download our free whitepaper: Like, Link, Share, Tweet: A How-To Guide to Video + Social Media.